Over the past few years, social media marketing has made dramatic changes thanks to the introduction of paid advertising and promoted posts on Facebook. Yes, Facebook marketing has become an enormous function for many businesses across the globe, but many smaller companies are still left scratching their heads when it comes to what type of Facebook ad they should be using and why. So, to help clear the air, we’ve put together the full list of Facebook ad options, their functions, how to create them and when they should be used by businesses for their digital marketing strategies. 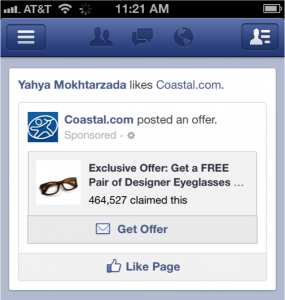 There are numerous ways to start an ad on Facebook, but the main starting point is from your personal home screen. What it is: This function allows you to choose from a list of posts that your page has already sent out on Facebook and promote them to a targeted audience that you decide upon. What you do: Once you click on the “Page Post Engagement” option, you will be shown a list of past posts you’ve created with the most recent on top (quick hint: it’s best to promote your most recent posts unless you have a specific posts you put together at an earlier date). 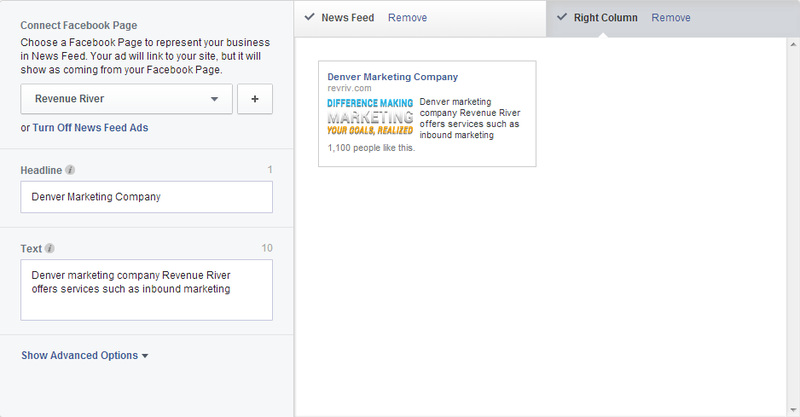 Once you’ve chosen which post you would like to promote, you will have the option of keeping your ad up to date by allowing Facebook to automatically update your promoted post with your most recent posts (not a bad idea, so long as you keep in mind that your future posts will be promoted when putting them together). From there, you will be taken to a preview screen that gives you the option to promote your post within news feeds, on the right hand column of the screen or on both, all while showing you a preview of what they will look like. If you choose to promote on the right hand side of the screen, know that you will be working with a small amount of space and that there should be little text and an easy to see picture included. Once you’ve decided where you want your post to be seen and are happy with the way it looks, it’s time to choose who you will target with it. There are many options that allow you target a broad range of users or an extremely specific section, depending on who you’re looking for, so spend some time figuring out exactly who you want to see your post before filling this section out. From there you will fill out your account information, set your budget and schedule your campaign (either running it continuously or through a set start and end date). Finally, you will have to decide on how you wish to bid for your objectives. If your end goal is to get more engagement on your post, then you will pay every time the ad produces any type of engagement while if you goal is to increase page likes then you will only pay for every like that the ad gets you. From there you will be given a pricing option dependant on your bid choice (usually automatic pricing versus manual). There you have it! When you use it: Promoting past posts through this tool is best for when you want to either reach a new audience or engage your current following even more. Be sure you promote a past post that performed well with your own following and includes a picture and information that explains what your page is about and possibly has a link. This tool can also be handy for helping to increase page likes so long as the post is put together properly. What it is: This function helps you create up to 6 different targeted ads for your Facebook page meant to help attract and increase page likes. What you do: Once you’ve clicked on the “Page Likes” section, you will be taken to a page that will help you create your ad/ads. First, you will be prompted to choose up to 6 different pictures to be included in your ads. There are no added costs for using more than one picture and Facebook tests the different pictures to find the one that performs the best. You can choose to utilize pictures from your profile or upload a specific image and also have the option of cropping and repositioning them to ensure your ad looks the way you want it to. From there, you find a section allowing you to create content for both the headline and body for your ad, as well as choose where you would like your ad to be shown (news feed, right column or both). You can also dictate where you would like the ad to take people once clicked on, ranging from your profile page to the different tiles you utilize on your profile. From there, the process is the same as the “Page Post Engagement” above (see the italicized section above). When you use it: Much like the “Page Post Engagement” section, this ad is best for when you would like to increase page likes but through a more customized post that doesn’t require you to first ad it to your wall. 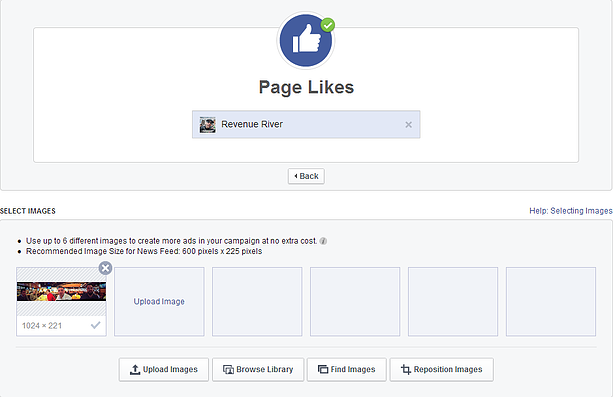 This ad is often used for placement on the right column and can help to target specific groups you wish to like your page. What it is: This functions works in much the same way as the “Page Likes” section, but instead promotes your website instead of your Facebook page. What you do: Once you click on the section, you will be prompted to insert your website’s URL. You will then be able to use up to 6 different images (from your Facebook, from your own files or from shutterstock) before adding a headline and content for the ad and deciding on where you would like it to show up on Facebook (newsfeed or right column). 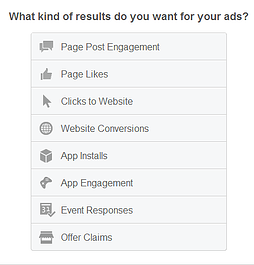 From there, you go through the audience targeting and payment sections (see “Page Post Engagement” section). When you use it: This ad not only allows you to share your website to your chosen audience, but can also help you promote a specific page whether it be a product/services page, a blog or a landing page. If you have a specific promotion running through your site or have a certain product or service you would like to advertise, this is a very useful function. 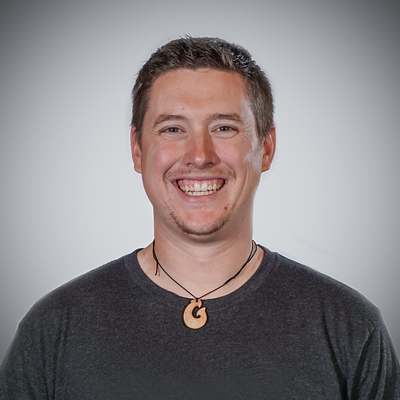 What it is: This function is much the same as “Clicks to Website” but allows you to track any specific “conversions” that take place as a result of someone clicking on your Facebook ad. What you do: The process of creating a conversion tracking pixel is the first step in utilizing this function and is best explained by Facebook here. Once the pixel is created and properly added to your website, you will be able to create your ad in the same fashion as before. This can be a tricky process for those who are not used to code, so be sure to utilize this help page if you get hung up on the process. When you use it: This is best used when you want to sell something through a Facebook ad and would like to measure its ROI. What it is: This ad helps you promote a specific app (whether it be desktop or mobile). What you do: Simply include the URL for the app (from the app store or another site) and dress up your ad with content and either images or video (if you’ve made a video detailing what the app is and does, this is a great place to include it). From there you will choose your audience and payment plans like before. When you use it: If you’ve just created an app or have made major changes to it, this type of ad is great to get the word out there. It is also a great way to get the word out about your app and boost downloads. What it is: This function allows you to target those who have already downloaded your app to ensure that they are reminded about it. What you do: Once you’ve input your app into the section, you will be able to create ads (images, headlines, body text, etc.) that remind people about your app before sending them back to it when they click on it. Then move on to audience and payment. When you use it: This is great for getting people to come back to your app for reconversions or for spreading the word about a new update or function added to your app. 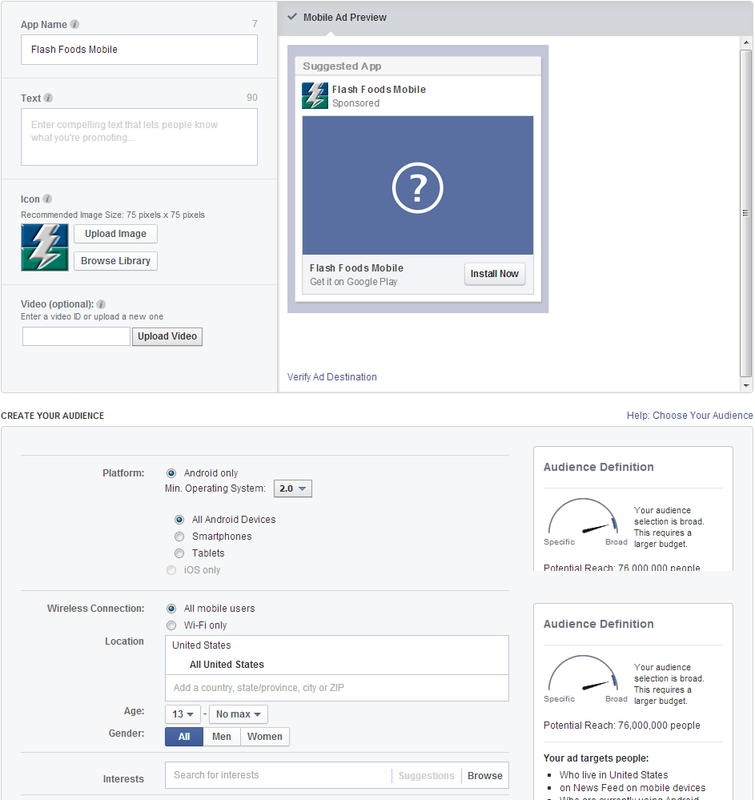 What it is: This function helps you promote an event you created on Facebook. What you do: Input your event in the bar, and then create an ad (images, headlines, body text, etc. ), then move on to audience and payment. When you use it: This is great for when your business or profile has created an event (party, cause, webinar, etc.) 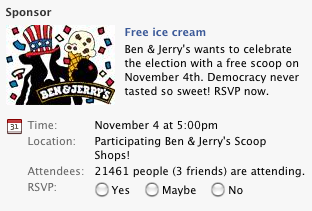 that you would like everyone to know about and RSVP for. What you do: Once you’ve created an offer, you will be given the ability to create an ad (images, headlines, body text, etc.) before moving to audience targeting and payment. When you use it: If your business utilizes different coupons for targeted segments online and through social media then Facebook offers is perfect for you. This function is perfect for promoting a public offer or coupon you wish to distribute. Facebook’s evolution has led to countless different types of advertisements, promoted content and more. While this post does not cover every single type of ad that is possible, it does give you a detailed look at the major ad hub for the digital media marketing side of Facebook. If you have any questions regarding these functions or would like to include more detail or hints, please feel free to leave them in the comments below!